?O, Zoo! is, in some ways, atypical of Hoffman’s work, being his most directly analytical examination of a set of film conventions. In films like On the Pond (1978) and passing through/torn formations (1987), a much more meditative and lyrical mix of image, sound, and narration offers an intensely personal view of childhood and family. Somewhere Between Jalostotitlan and Encarnacion (1984) deals with Hoffman’s reaction to an isolated incident in Mexico, the death of a small boy in the street. The Road Ended at the Beach (1983) is a diary-quest following Hoffman and some friends “in search of the Beat generation,” as they trek across Eastern Canada to find Robert Frank. All these films share an explicit personal voice (either in voice-over or written text), a voice by turns matter-of-fact, self-ironic, poeticized (here, often with less certain success), but always direct and Hoffman’s own. Robert Frank’s influence is central to the development of Hoffman’s sensibility. Aware of the filters the apparatus imposes between film and experience, the filmmaker seeks direct contact with his subjects. With Frank, Hoffman shares a concern for the articulation of the filmmaker’s subjectivity, and for the camera’s power to record and reveal events. Unlike Frank, however, Hoffman’s approach is tentative; as Blaine Allan puts it, Hoffman places himself “on the temporal and spatial edges of an event” (1987:91). In The Road Ended at the Beach, Hoffman ironizes the Frank persona to point, finally, to the folly of attempting to recapture the immediacy of the Beat generation’s attitude to “experience.” When he finally finds Frank in Nova Scotia, Hoffman is told, in a low key (and utter) deflation of his quest, that Kerouac is dead, the Beat generation is over, go home. The “fiction film” is A Zed and Two Noughts (1985); the director, Greenaway. Hoffman and Greenaway met at the 1984 Grierson Documentary Seminar held in Brockville, Ontario. The seminar that year, entitled “Systems in Collapse,” was devoted to the anti-documentary. The Seminar began after Grierson’s death and within the fiction of the first sequence, Hoffman conflates the seminar with the National Film Board (NFB), founded by Grierson in 1939. “That old battle-axe” is an appropriate description of the mythical crusty Scotch Calvinist; to underscore the point, the phrase appears over a close-up of an ostrich’s head. The physical similarity to Grierson is striking. Grierson hovers as a key figure behind both the Canadian and British documentary traditions, and is thus a point of departure for both Hoffman and Greenaway. His unique legacy as film director and administrator, to the end of an openly propagandistic film product in the service of the state, makes the “Griersonian” mode of documentary a particularly acute model of what Noël Burch calls an “Institutional Mode of Representation” (1979). Certainly, one can identify an NFB house-style with as many stylistics as any Hollywood studio study could muster. Greenaway worked for 8 years in the British equivalent of the NFB, the Office of Information. During that time he produced, as he calls it, “soft-core propaganda” (cited in Della Penna and Shedden, 1987:20) before turning to experimental and narrative fiction modes of filmmaking. Especially in his hyperbolically parodic anti-documentaries, The Falls (1980) and Vertical Features Remake (1979), Greenaway works to great advantage off the solidity and recognizability of the government-issue documentary. Systematic in their astonishing mimicry of form, and profound in the depth of their analysis of the technocratic ideology at the base of Grierson’s form, Greenaway’s films initiate a full-frontal assault on the Griersonian institutional mode. Hoffman’s confrontation with the Grierson mold and myth and with Greenaway’s analytic project are oblique, even affectionate. ?O, Zoo! adapts the central formal device of Greenaway’s critique–a coherent voice-over ordering disparate images to create a hermetic non-referential fictional universe–to the rhetorical traditions of the narrated personal diary-film of the independent filmmaker. The fiction of the grandfather frames Hoffman’s own penetration of Greenaway’s narrative film production, less to satirize (*1) Greenaway than to harness the skeptical dynamic of Greenaway’s voice-over/image relation. While the extreme artifice characteristic of Greenaway’s later cinema is concentrated into his elaborate visual tableaux, in his earlier films, Greenaway’s artifice is concentrated in the complex counterpoint between his soundtrack (Colin Cantlie’s voiceover narration and Michael Nyman’s music) and “documentary” imagery. Hoffman mobilizes Greenaway’s counterpoint but refuses to capitulate his filmic world entirely to fiction; instead, Hoffman keeps his meditation on events focussed on what he calls “lived experiences”. Complementary sound/image relations serve the production of coherent, stable meanings in the text. Later in the essay, when Grierson speaks of the use of “chorus,” he says it must be in the service of unity: “By the chorus, characters are brought together and a single mood permeates a whole location” (1966:160). Interestingly, he notes of the “recitative chorus” that “the very crudest form of this is the commentary you find ordinarily attached to ‘interest’ films” (1966:161). 1 Yet even if Grierson favours, at this early point in the 1930s, a voice-over narration “which adds dramatic or poetic colour to the action” (1966:161), that “colour” must not in any way create conflict. Rather, it must enhance meaning. As he said of the general desired effect of the propaganda film, the voiceover should “inspire confidence” not present “problems” (Morris, 1987:45). Grierson’s dislike of Humphrey Jennings’s WWII films demonstrates how the “creative use of sound” must not be in any way disturbing. Moreover, the overarching dominance of the “recititive chorus” in the Canadian WWII documentaries made under Grierson’s command demonstrates how the route of least resistance to a strong propaganda message is through “authoritative narration” (Elder,1986-87: 157). The complementary voice-over/image relation is the bedrock of the institutional documentary. The image track is arranged to illustrate the narrator’s descriptions and the indexical power of the [**add: photographic] [**sorry to add a word, but not all images are indexical] image is harnessed to the rhetoric of the soundtrack. This places its referential authority in the service of an authoritative voice-over narrator, usually male, whose own vocal performance is coded by standardized diction, pacing, clarity of tone, and coherence. Greenaway’s mimicry of this convention is superlative. In Vertical Features Remake, Colin Cantlie’s “BBC voice” explains the attempts of the “Institute for Restoration and Reclamation” to reconstruct a film by a “TulseLuper.” As names and places appear on the soundtrack, photographs, drawings, and moving images appear on the image track to illustrate the often convoluted but always self-assured narration. The insistence of the illustration is key to the satire; the film cuts to the same photograph of Tulse Luper no fewer than 23 times. Hoffman’s clearest appropriation of Greenaway’s method of constructing a fiction in fake documentary form appears in the opening sequence of ?O, Zoo!. Instead of attacking the authority of the institutional narrator (Greenaway’s target), Hoffman undermines a different set of conventions: those surrounding the authority of the filmmaker-narrator of the personal diary film. Interestingly, ?O, Zoo! is the only early film of Hoffman’s where he does not read his own narration. Reminiscent of Hollis Frampton’s (nostalgia) (1971), where Frampton has Michael Snow read the voice-over of his most obviously “autobiographical” film, Hoffman puts himself at one remove from the “revelations” contained in ?O, Zoo!. If Hoffman differentiates the “voice” of the institutional newsreel from that of the personal diarist, he also invokes his own tradition: Canadian experimental filmmaking. One shot of the stock footage Hoffman uses has already been incorporated by experimental filmmaker David Rimmer into his film, Waiting for the Queen (1973). The allusion is, first, proleptic of the levels of intertextuality in the film as Grierson, Greenaway, Vermeer, and a variety of tropes of structural film make “appearances” in ?O, Zoo!. More specifically, it refers to the tradition of Canadian experimental filmmaking that interrogates the photographic image. Rimmer, for example, often uses stock footage to study image degradation through looping, so Hoffman’s term “repetitive” is apt. When Hoffman later implies that the NFB is an organization devoted to the filming of wildlife, he makes allusion both to Greenaway’s obsessive filming of animals (and the setting of A Zed and Two Noughts in a zoo) and to the stereotypical NFB nature documentary. The inversion is here complete: within the fiction, the “personal” images of the grandfather are linked, by subject, to the institution of the NFB. Meanwhile, the stock institutional images of the public event allude to the independent experimental tradition. “Precision and self-control” are qualities of the text and its “maker,” but not of the viewer. Moreover, the “self-control” is an arbitrary limit set by the apparatus; Hoffman’s camera is a spring-wound Bolex, whose full shot length is 28 seconds at 24 fps. After the shots of the camel, the film cuts to a close up of a piece of paper titled “Camera Negative Report Card,” dated 6/6/45, with neat, legible printing listing six shots, all under the heading “Day 17”: “Lion”; “Elephant slo-mo”; “Fallen Elephant tries to get up”; “Elephant gets up”; “Camel Chewing”; “Insert Humps.” Here is another piece of the film apparatus exposed – and if we read quickly enough, we can see that shot list supports what we’ve been seeing. But questions arise: if this is a slip of paper the contemporary narrator has found, why would it be filmed with the same sepia tone as the grandfather’s footage? The characteristics of different documents (paper and film) begin to collapse into one another. Later in the film, we see that the contemporary filmmaker also uses these cards to chart the progress of his Holland diary, following in the family line, it seems. But here, too, the very neatness of the “documents” indicates that they are fictional constructions, not a log representing the process of filmmaking but a later construction caught in the false hermetic package of the fiction. All the shots listed on the grandfather’s cards appear in ?O, Zoo! (unless the film has a 1:1 shooting ratio, the report sheets must be reconstructions); both the grandfather’s and the filmmaker’s cards list “S. Mangor” as cameraman (explicable by continuity of family name, but improbable). Finally, later in the diary, we see the right hand part of the grandfather’s card from the first sequence, now dated 6/6/85, as a hand tapes a second card to it and writes “Day 17.” This notation completes, in a sense, the missing left side of the grandfather’s card (also Day 17). It would seem that even off-screen space can be recaptured by the hermetic bounds of the fiction film frame. This passage appears over shots of animals (a seal, peacocks, an ostrich); images which reinforce the grand father’s employment with the institution dedicated to wildlife photography. The phrase, “documentation and categorization”, alludes to Greenaway’s obsession with classification and naming – that technocratic rage to order laid bare in Greenaway’s films by the hyperbolic application of that rage. Though the allusion is no more than a nod to Greenaway’s project, in recognizing their shared heritage in Grierson, Hoffman acknowledges the ideological implications underlying how documentary convention orders experience – and the subversive nature of any questioning of that ordering. The narrator presents another piece of documentation, apparently a tape recording of the grandfather’s voice (the voice explains the whirring as a tape recorder rewind), literalizing the idiom, “I can still hear him say….” What the narrator hears in his mind can be conjured for the film. The question, “What does he know about this land anyhow?” refers to Grierson’s status as a foreigner to Canada and underlines one of the central ironies of the NFB: an institution designed “to show Canada to Canadians” is founded by a Scotsman. The last line of the “recording” is ambiguous, a false “rough edge” attesting to its status as “document”. The “sync” water sprinkler sound (an allusion to another of Greenaway’s obsessions, water), and the introduction of music, fleshes out the possible range of sound at the narrator’s disposal. The gradual and very subtle introduction of each sound option in O, Zoo! parallels the increasingly arbitrary rhetorical power of the narrator and the complexity of the fiction he weaves. The “authenticity” of the “personal” voice-over is first established, and then used as a springboard for the introduction of more and more conventional rhetorical effects. All of this precedes the announcement of the film’s overarching form: “As usual, I would keep a diary of the whole affair”. This short film around a fiction film has its own enigmas to be worked out in its “narrative” progression. In the passage above, the narrator puzzles over the connections between Greenaway and Grierson, between Greenaway and the Documentary seminar. On one ingenuous level, of course, the puzzlement is justified; Greenaway’s films are, indeed, fictions, and further, are absolutely antipathetic to “Griersonian” documentaries. In specific reference to the 1984 seminar, the “puzzlement” registered by the narrator translated to outrage on the part of many conference participants. The challenge that the anti-documentaries shown at the seminar presented to seminar participants, for whom the Grierson Documentary Seminar was typically a “tribute” to Grierson’sofficial legacy, led to violent debates and charges that films like Greenaway’s The Falls were senseless hoaxes. In ?O, Zoo!, Hoffman seems to be quietly satirizing this debate. Working out the relations between Greenaway and Grierson is one problem the narrator will tackle. The second is the resemblance he notes between his “grandfather’s footage” and Greenaway’s films. On the level of the fiction, the narrator says he will incorporate his grandfather’s footage into the film he is “about to make” in Holland – the sequence we have worked through is, in a sense, a different film than the ?O, Zoo! to come. On the most banal level, the narrator “discovers” that “the director” shares his grandfather’s fascination with animals. More substantively, Hoffman seems to be announcing that his own exploration of the relations between Grierson and Greenaway will be effected precisely by taking a page from Greenaway’s book. Here, the narrator introduces a hermetic fiction by pretending that his grandfather’s footage is not his own. These two levels interpenetrate to present two problems: one to the viewer, the problem of reading ?O, Zoo! between the levels of fiction and actuality, between the image and the voice-over. The second problem is Hoffman’s. When he says, “as usual” he would keep a diary of the whole affair, Hoffman is situating the film within his own practice and his own preoccupations – not Greenaway’s assured multiplication and excavation of fictions but his own tentative probings of the problems of representation. The “resolution” of these problems of reading and making appears as the film finally incorporates the two missing shots from the Day 1× shot card: “Elephant tries to get up,” “Elephant gets up.” Just after the diary section shows us the right half of the grandfather’s shot report, the narrator tells a two-minute long story over a black screen, about his witnessing and filming an elephant having a heart attack at the Rotterdam zoo. The passage is descriptive and emotional, centred around the filmmaker’s crisis of conscience in deciding to film the death, and the responsibility and guilt that accompanies it. In the end, he decides “to put the film in the freezer. I decide not to develop it.” At the end of the film, after the credits (in a sense, after the end of the film), two extra shots, both 28 seconds long, sepia-toned, and silent, show an elephant struggling to get up and then an elephant getting up. The effect of this enclosure of a frame around ?O, Zoo! is double-edged. In one way, these last two shots expose the artifice of the voice-over. The events of the first shot (the elephant rocking back and forth, the attendants shoving bales of hay under the elephant) match the earlier voice-over, but in the second shot, the elephant gets up. The narrator lies twice. First, he developed the footage, and second, the events of the story are contradicted by the image. This decisive break in the fiction takes place by a radical separation of voice-over and image: the story is told over a black screen, the final images are silent. With this separation, the viewer can return to the film to reconstruct, in a sense, its non-meaning, and to question and revise the “authenticity” of the versions of events the film presents. Working through these possibilities, of course, suggests that a thoroughgoing skepticism is called for in the viewer’s relation to the film, and especially to the narrator’s voice-over. For example, do the final images tell the whole story? Is there more elephant footage than is shown or listed? Is the order of the last two images correct? However, thoroughgoing skepticism is not, it seems to me, the final affect of ?O, Zoo!. It is important to note here a crucial difference between Greenaway and Hoffman: Greenaway’s oeuvre is obsessively interwoven with recurring images, themes, and characters, but his fictions are rigorously hermetic and unconcerned with the codes of realism. In ?O, Zoo!, Hoffman exposes the hoax; moreover, the emotional resonance of the elephant’s struggle is highly charged and excruciating to watch. One suspects that if the story of the elephant’s death is a fiction, it is still a fiction filtered through Hoffman’s sense of the crisis of representation. The key to Hoffman’s sense of his own intertextuality is the line in the voice-over, “I’ve come across this problem before.” This statement refers to Hoffman’s film made a year earlier, Somewhere Between…. , where Hoffman, travelling by bus in Mexico, comes across a crowd of people around a dead Mexican boy just run over in the road. Hoffman puts away his camera, and cannot film the scene. Somewhere Between… is structured around the absence of the visual representation of the event, which is instead described in written text ‘voice-over.’ Yet, while making ?O, Zoo!, Hoffman did begin to shoot the elephant’s struggle, not knowing if the animal would live or die. The absence structuring Somewhere Between… becomes a kind of contingent presence in ?O, Zoo! Just as Hoffman gathers and organizes the images of Somewhere Between… to hint at, refract, and rehearse the moment of hesitation at the heart of the film, so in ?O, Zoo!, he organizes the film around the potential consequences of his decision to film the event – a kind of rehearsal of the variety of responses he felt as he filmed. The expressive urge behind Hoffman’s work, always constrained by its tentative, questioning attention to and awareness of the process of filming, distills itself into the structure his films adopt: radically extended meditations on a single, almost ecstatic moment. When Hoffman showed Somewhere Between… at the 1984 Grierson Seminar, he was taken to task by a veteran war corespondent, Don North, who wanted to see the scene of the Mexican boy’s death. Shelley Stamp, reporting on the conference, writes, “[North] felt that the film would have been stronger with the addition of the death. What North missed, I think, was the very structure this absence provided, and Hoffman’s implied critique of North’s type of filmmaking”. The nature of Hoffman’s critique is clearer in ?O, Zoo! In the voice-over story, the narrator rationalizes his decision to film the scene with the lame excuse: “Maybe the television networks would buy the film and tell people the tragedies in their neighborhood”. After the elephant “dies”, he admits, “My idea of selling the film to the network now just seems an embarrassing thought, an irresponsible plan”. If this statement names the terms of Hoffman’s meditation on representation it does not reflect the intensity of the tension felt between the extraordinary control a filmmaker has over images and the guilt they arouse, nor the sense of danger around Hoffman’s approach of the particular “lived experience” at the core of these films, namely, bearing witness to death. Hoffman makes explicit that central insight and concern of radical independent film practice and theory: film’s status as a radical metaphor for consciousness and its relation to the world. The capacity of film to mediate the relation between consciousness (“as if my mind was the film”), and events in the world, centres around its indexical nature (“permanent trace”). This mediation with carries the potential to represent death and suggests a radically powerful level of epistemological inquiry carrying both an intimation of the ecstatic – outside space and time – and what Jean Epstein has called “a warning of something monstrous” at the heart of cinema (1977:21). The “responsibility” Hoffman feels around this encounter with death is keyed by the phrase “projected”. For if film is a radical metaphor for consciousness, we must understand the double-hinged nature of that metaphor as it swings between filmmaker and spectator. Hoffman’s hesitations regarding filming, or developing, or showing his experience of death revolves around a terror of the urgent but reckless energy that representation burns into the filmmaker and the viewer. If the filming of a moment of death is the central expressive theme of Hoffman’s film, its representation and deferral is never divorced from his recognition that the weight of film history and convention always interposes itself and structures the spectator’s access to the image. The engagement of film history in ?O, Zoo!, especially with the Griersonian documentary tradition with its central claim to absolute truth, underlines the epistemological stakes behind Hoffman’s questioning. Hoffman wants to bring the conventions and history of the construction of certainty to crisis, to clear a space for the spectator to approach, with Hoffman, the intensity of fascination and doubt inscribed in that image which appears literally as supplement, as coda, to the text of the film. The point is not to escape mediation – this is not an Edenic pure image. Nor is it to restore certainty. Rather, Hoffman clears a space for consciousness to reengage the world in “lived experience” via representation. Allan, Blaine. “It’s Not Finished Yet (Some Notes on Toronto Filmmaking).” Toronto: A Play of History (exhibition catalogue). Toronto: Power Plant, 1987. 83-92. Della Penna, Paul, and Jim Shedden. ” The Falls .” Cineaction! 9 (July 1987): 20-4. Elder, Kathryn. “The Legacy of John Grierson.” Journal of Canadian Studies 21.4 (Winter 1986-87): 152-61. Epstein, Jean. “The Universe Head Over Heels.” Trans. Stuart Liebman. October 3 (Spring 1977): 21-25. Grierson, John. “The Creative Use of Sound.” Grierson on Documentary. Ed. Forsyth Hardy. London: Faber, 1966. 157-63. Gunning, Tom. “An Aesthetic of Astonishment: Early Film and the (In)credulous Spectator.” Art & Text 34 (Spring 1989): 31-45. Hoffman, Phil. “Artists and their Work: Phil Hoffman.” Pamphlet. Toronto: Art Gallery of Ontario, 1985. Morris, Peter. “Rethinking Grierson: The Ideology of John Grierson.” Dialogue: Canadian and Quebec Cinema. Eds. Pierre Verroneau, Michael Dorland, and Seth Feldman. Montreal: Mediatexte/Cinematheque Quebeçoise, 1987. 21-56. Stamp, Shelley. Program Notes for Somewhere Between… . pamphlet. Toronto: Canadian Filmmakers Distribution Centre, 1984. Winston, Brian. Claiming the Real: The Documentary Film Revisited. London: BFI, 1995. DD: Can you tell me a bit about how you went about shooting and editing Somewhere Between Jalostotitlan and Encarnacion? PH: I had been reading some Haiku poetry at the time. Haiku is a Japanese form of poetry which is very simple, yet complex in its simplicity. In fact, when I went down to Colorado that was a poetry convention of sorts. So I decided what I wanted to do in Mexico was shoot in a similar fashion, borrowing from the form of Haiku poetry. I tried to think of the Bolex camera’s twenty-eight second wind as a structure rather than a limitation. Most of the shots in the film are twenty-eight second takes: the “breath” of the Bolex camera. I tried to make each shot sparse in its content: the coke sign, the donkey, the open road, the mother and child running, (c) simple, uncomplicated shots. In shooting The Road Ended at the Beach, I had a lot of expectations… about “the big trip”. I felt I had to make the film, it was my first since school. There was a lot of pressure and tension and not much fun. So it was important with Somewhere Between Jalostotitlan and Encarnacion to shoot when I felt like shooting so it would be more like writing poetry. DD: But it wasn’t until you returned that you decided it would revolve around an image you didn’t have. PH: Right. So in a way it was a lot of little poems. On the trip I kept a journal and I tried to write little phrases based on the haiku form. Not that it was at all like traditional haiku. I tried to develop a style, to let a form develop out of an idea. When I came back from the trip I didn’t know what the film would be about. I hadn’t shot that much film—about seventeen minutes—and the film is only six minutes long, so it was pretty economical. When I came back, the experience on the bus was still on my mind. I didn’t have the footage and didn’t regret not having it, it was something I just didn’t want to do at the time. I remember putting the camera down and thinking no, I don’t want to do this. DD: The sparse images you described facilitate open interpretation. The emptiness opens to the missing image. PH: They’re open but there are still some things that were on my mind while shooting. I kept going back to the churches. DD: Are the religious images linked to the boy’s death? PH: No, they’re a reflection on my own experience as a Catholic. Religion is most visual in Mexico. I was interested in icons and in the beat people—beatific in the Kerouac sense—sympathy to humanity. I see more spirit in the people than in the icons, let’s put it that way. DD: How do icons function in the film? We talked earlier about film language. The meaning of the images is largely defined through the film itself through their relation to the death, and yet the icons have such strong connotations. PH: Yes you can interpret an icon in many ways. For me it was a way of working through Catholicism. You’ll see more of it in my next film. DD: Did you decide to tone the black and white footage to facilitate a less dramatic contrast with the colour footage? PH: From a formal standpoint it helps blend the high-contrast shots with the colour. I also wanted it to look old—but not the way we are used to seeing representations of the past in film. Hollywood uses sepia. My first text states “looking through the lens/ at passing events,/ I recall what once was/ and consider what might be.” The first shot is of a black band. We hear the music of a saxophone and see a trumpet. There’s a sort of visual/aural pun there. We’re used to sync sound, but in the last line of the preceding text it’s clear that, well, with film we can do whatever we want. DD: In the text you changed tenses. For example in the third text: “The white sheet is pulled over the dead boy’s body/ the children wept.” It’s almost like looking at someone’s memory. The temporal connections are unclear but we’re content with ambiguity. PH: I believe in an open form where you’re not told what to think. I suppose it is a metaphor for memory. I honestly didn’t think about the different tenses in the text, I went with what sounded good to my ear. It jumps around and that’s in keeping with putting myself in the past while making, finding myself on the bus again, while I’m really at home in my Bathurst Street basement. DD: The shot with the Coke sign and the donkey cart has temporal ambiguity too. The sign is obviously modern and the cart so primitive. PH: Again, there are many ways this can be taken and the ambiguity is important. For example, the last text: “big trucks spit black smoke/ clouds hung/ the boy’s spirit left through its blue.” What is that blue? Is it blue smoke from the trucks? The blue of the brick wall? DD: It brought me back to the wall. PH: It did? That’s one of the things I liked about the line. It is ambiguous and I don’t profess to have an answer. To end on a line like this ” the boy’s spirit left through the blue” it’s almost like a traditional religious experience. I suppose this brings us back to my Catholic history and the icons in the film. The line is directly from the journal and was written on the bus. I suppose it was the blue sky that I saw at the time. DD: I’m comfortable with ambiguity. I guess it’s partly because the second text tells me that there’s no footage of the central image. I don’t have expectations. I don’t wonder how the boy died. PH: It was the second death I’d seen on the trip. The first was a terrible car accident in Colorado. I didn’t film that either. The windshield was the movie screen and the camera was right there, but no way. DD: Do you remember deciding not to film the Mexican boy? PH: I remember my hand on the camera and it would have just been a matter of leaning out. I guess all the media footage we see every day flashed through my head. DD: I think the absence of the footage is more striking. We’re saturated with media-like images. PH: Well, the media images are striking, but I think in this case actual footage wouldn’t leave any room for analysis of death and our feeling towards it. Media images are too overpowering. That’s why I put the camera down. I think it’s more successful as a meditation in its absence. There is another text which I think is awkward, yet perhaps one of the most important: “I should have a bible,/ you suppose I lent it to someone/or someone stole it.” Most people ask, “Is that poetry?” It brings us back to the first person that’s having this experience. For me, it symbolizes a loss of religious faith in the Word, in the icon, in what we’re taught in religious classes. Today the Bible seems irrelevant. People take whatever meaning they want and use it for their own cause… and yet the Bible (like the film) is an open form. Its ambiguity facilitates many interpretations. DD: I guess it’s a question of how didactic one is about a particular interpretation. PH: Perhaps that’s how it should be read. Let people read it and take out of it what relates to their experience… rather than Jim Baker and the P.T.L. Club saying what it means. DD: For me, the music really helps define my proximity to the central image. When the tempo is upbeat, in the shots of the two bands for example, the boy is almost forgotten. When the music slows I feel closer to the tragic event. Can you explain how you and the musician decided upon the music? PH: I showed Mike the film and we worked on it together. I left the film with him and he worked with it and soon certain riffs started to develop, and then it was just a matter of getting it right. We did six takes and I edited the first version which I wasn’t really happy with. Because it was edited it didn’t seem continuous, it didn’t seem to flow, so we tried again. This recording went directly to 16mm magnetic tape. There were things that he did that, if he was three frames off, it would change the mood completely. We did seven new takes and finally we felt we had it. We were both really tired but decided to try one more and we got it. Only one section was edited, I took that whole section from the sixth take. I think it’s hard to write the music down, it’s certainly possible but perhaps it’s not as direct. I like to work in a way so that everything comes out of experience. DD: The diarist of The Road Ended at the Beach expresses frustration and disappointment at the failure of events to live up to expectation. One has a strong sense that the camera comes between you and your fellow travelers, thatit distorts what you want to record. PH: At one point in this film I state: “The best time for me is when I’m on my own with the camera.” Later there’s another reference to how the camera gets in the way. At this point the spectator realizes that the camera is part of the event. In the first part of the film we are painting the van, it’s very mysterious. The guys are preparing for the trip west. It’s very linear at first, setting up the form. I suppose one of the first references to the camera is in a shot in the cabin. Rub Chan asks me if I want some whisky and starts to get up. Richard says, “No, No, No, don’t get up.” And I get out from behind the camera. It’s the first filmic reference to the camera. There are a lot of problems with directly autobiographical films. It seems that when a film is too direct, too personal, you meet a lot of obstacles. I tried to use my personal experiences as a vehicle for something more universal. In Somewhere Between Jalostotitlan and Encarnacion the universal experience is death. It’s an analysis, not just of personal experience, but of how this experience is incorporated in a much larger context. A man plays a trumpet in an outdoor street mall in front of some shops in Boulder, Colorado. He is wearing dress pants, a white golf shirt and a top hat. To his left are two men sitting, one playing on a makeshift drum set and one playing a banjo. In the background a few pedestrians stroll by paying no attention to the black street band. There is a static shot (color) of a street corner in a small Mexican town. The sky is blue with a few clouds. The street is vacant except for a man sitting in his buggy drawn by a donkey. The street scene is dwarfed by a huge Coca Cola sign. A white taxicab with green stripes drives down the horizontal street followed by a yellow pick-up truck (frame left to right). A child, followed by mother, jog across the vacant street, to the opposite side of the road. They begin to walk down the sidewalk of the street. A shot, framed between two pillars, shows the partial view of an interior of a church. Moveable chairs sit in rows facing frame right. There is an isle between them, making two sections. Two children enter frame left and sit on the two chairs on the outer sections at the edge of the isle. They talk amongst themselves. A third, smaller child enters frame left and walks down the isle to the row ahead of the two who are sitting. The child looks back at the two and tries to climb up onto the seat. Unable to do this, she looks back at the pair and attempts the climb again. A hand-held dolly shot (frame right to left) exposes the degrading walls of a Mexican street. The camera pans right to include the alley being traveled upon. On the opposite side of the road is a line of parked cars in front of some two-story houses with white windowpanes. The camera tilts up the paint chipped wall towards the clear sky. Above the wall towers the steeple of a church. In the distance a group of people are gathered just outside the pillared entrance to a Roman Catholic church. They all face away from the camera, kneeling on the cobblestone walkway outside. A few people enter frame right and join the Mexican worshippers. A hand-held dolly shot (frame left to right) faces the bare walls of the exterior of some houses. As the camera turns a corner, the alley can be seen, as well as two lovers embracing in the corner. At the end of the narrow alley is a ‘T’ junction created by another building. i should have a bible. A painter sits on a chair in front of a painting of Jesus. He is painting a copy. A close up shot of painter. He continues to paint a copy of the face of Jesus. Cars pass by on a roadway, a blue brick wall covers the frame. A close up shot of a brush paints Jesus. The camera pans down the brush to the painter’s hand. In a profile shot, the painter paints the brow of Jesus. The `original’ painting faces the camera. An extreme close up shot of the religious painting. A static shot of a blue brick wall. A religious procession, ` The Feast of Fatima,’ makes its way up Bathurst Street in Toronto. A girl in a white dress and veil walks past and looks towards the camera (right to left). A pair of kids dressed in angel-like costumes walk in front of the camera and out of frame (right to left). Cars pass through and intersection where the kids crossed as two more people walks past the camera in religious costumes and look at the camera. A low angle shot films the top of a house and an overcast sky masked by power lines. The statue of Jesus rolls through the frame (right to left). (Secondary Image 3) The camera tilts down to a group of Portuguese worshippers walking dressed in religious attire, carrying the statue. Some look at the camera. A close up shot of ladies faces cross the frame (right to left). They looks into the camera. More people cross the frame. An extreme close up of the bottom of a woman’s white dress crosses the frame (left to right). The camera pans to the right and exposes a line of people walking down the street (left to right). A low angle shot of a Mary statue clasping her hands passes through the frame (right to left). A voice through the window. A hand-held shot travels from left to right down a sidewalk. A young child wearing a white dress stands in front of a paint chipped stone wall. She has one hand to her mouth and the other holding out a silver shiny tray. The camera continues to travel towards a group of Mexican street musicians. A man wearing a dress shirt, dress pants and black cowboy hat plays a trumpet. To his left are two young kids. The one in the foreground is standing still looking away from the camera, the other stands against the wall in behind the first playing a drum that is harnessed around his neck. To their left, a man is playing a large drum. waits by her dead brother. I was still a young boy when I saw my first film. The impression it made upon me must have been intoxicating, for I there and then determined to commit my experience to writing…. I immediately put on a shred of paper, Film as the Discoverer of the Marvels of Everyday Life, the title read. And I remember, as if it were today the marvels themselves. What thrilled me so deeply was an ordinary suburban street, filled with lights and shadows, which transfigured it. Several trees stood about, and there was in the foreground a puddle reflecting invisible house façades and a piece of the sky. Then a breeze moved the shadows, and the façades with sky below began to waver. The trembling upper world in the dirty puddle—this image has never left me. We can see the development of strategies based on coincidence, accidents, indeterminacy, endlessness, and contingency in documentary and experimental filmmaking of the post war period expressly in this light. As a means to work through some of Kracauer’s insights around cinema and the “whole world”, let me turn to a specific work—the short ‘travel’ film Somewhere Between Jalostotitlan and Encarnacion (1984) by Canadian filmmaker Philip Hoffman. The film was shot under the influence of Jack Kerouac and inspired by the Beat Generation. Kerouac went on the road in the fifties to wander and to have experiences, to create a scene across cities, New York, San Francisco and Mexico. ‘On the road’ refers specifically to a mode of writing that is quite literally writing while en route. It is after The Town and the City and through On the Road that Kerouac developed his art of ‘spontaneous prose’, an improvisational method of writing in time connected to the flow of life like jazz. Famously he used a full roll of Teletype paper that matched the road and typed the novel almost continuously over three weeks. The roll enabled him to write without stopping, without interrupting the flow of words, essentially mirroring the experience of driving. Kerouac like Gertrude Stein before him, associates writing with a phenomenology of the mind, a writing that is “composed on the tongue rather than paper” (Ginsberg 74). Kerouac’s writing does not seek to transcend mediation so much as it does to document its actions so that writing becomes a record of the connection between inner and outer structures of perception, binding bodies to places through time. As much as it pushes the boundaries of presentness, writing like film, is always in the past. Although the fact of mediation between word and image is altogether different as Kracauer would stress. Hoffman made Somewhere Between, after attending a conference devoted to the legacy of On the Road in Boulder, Colorado. Yet Hoffman’s film is not so much on the road (the highway) as it is on the street, featuring two cities (Boulder and Toronto) and towns somewhere between the cities of Guadalajara and León. 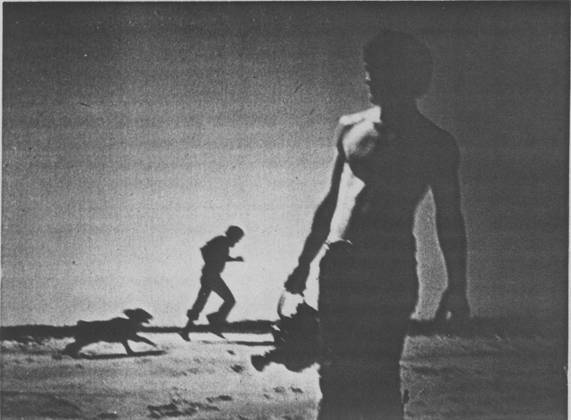 The film cuts across various scenes in these places with lengthy (often twenty-eight seconds) unedited sequences of action and black leader as “measured pauses” (Kerouac’s silence or breath) between sequences. These juxtaposed moments play out a reflexive rhythm that foreground the randomness and stubborn indeterminacy of the images of everyday life, and of their placement in the film. We are presented with situations that are delimited without being explicated. The film opens with a text on the screen: “Looking through the lens/ at passing events/I recall what once was /and consider what might be.” Two early sequences in the film give image to these words. The first is an image of what is now a cliché of globalization. The static camera poised on a street corner in the centre of a small town in Mexico, frames in long shot, a mule and buggy parked beneath a large red Coca-Cola sign, a tangle of telephone wires above low rise dilapidated buildings. The only movement in the frame is the cars, driving in and out of it, and a woman and child crossing the street. Yet movement and layers of interaction are implicit in the juxtaposition of the mule and the global corporation, which co-exist in this place. This image is preceded by another static shot of a church down the street, doubly framed between two pillars of a Catholic arch. Looking in, the camera reveals someone deep in prayer. After a motionless few seconds, a child interrupts the stillness of the sequence, enters the frame and begins a game of crawling up and down on chairs. The child’s sudden appearance is precisely that kind of “unexpected incident” that Kracauer delights in—“the stirring” of nature and people that the Lumiére films first captured. The kind of “spontaneous writing” that we often find in experimental ethnographies favors a self-reflexive methodology. In this instance, focusing on the physicality of the scene to include the temporal structure imposed by the camera (i.e., the spring wound Bolex’s 28 second take) and the filmmaker. The acts of “looking through the lens” as Hoffman’s text tells us, calls upon a time-based aesthetic where past and future co-exist beyond the edges of the frame. Yet it is not only the film strip/ flow of life analogy that foregrounds this temporality. It is also the reoccurring themes of religion and children, of tradition and horizons that Hoffman finds across the different places in the film. Given that the film concerns the story of a Mexican boy run over by a truck somewhere in Mexico, these themes resonate throughout. The boy’s death is an event that the filmmaker refuses to film (or include in the film) but instead conveys through a poetic text on the screen that is intercut throughout the film. Filled with black holes overwritten with the poem that remembers the boy’s death, the film’s architectonics are structured by the words that never conflate the commonalities between the situations. The poem embeds the boy’s death in all of the images of the film so that it is not inconsequential to the corporate sign, the superstructure in the opening images but rather stands in a contiguous relationship to it as to all the images in the film. The melancholic saxophone that draws the line from Mexico to Colorado to Toronto, seems to synchronize momentarily with the musicians and children holding out cups to collect money in these different places but then separates and floats over them from an off screen space that leaves the frame open to a multiplicity of found stories: children playing games on different streets in different cities, a crowd kneeling outside a church, the Feast of Fatima procession in a Portuguese neighborhood in Toronto, little girls dressed as angels and streets lined with telephone poles, the beautiful patina of pealing walls aged by the weather, graffiti palimpsests in different languages, a paint brush sketching a likeness of Jesus from a painting of Jesus, a child crawling up and down on a large sculpture of a sea shell in an outdoor street mall, a pond surrounded by trees at dusk. The camera stages situations from a distance and in long shot; sometimes the movements of bodies are slowed. But it is the materiality of the built environment that is framed to equalize the human and the non-human (trees, benches, windows, sidewalks, statues, cars, signs) which are counter influencing and interpenetrating processes. We see here the manifestations global cultures, national and urban idioms and technologies that the film stages as commonplace. In the study of localities, filmmaker and anthropologist David MacDougal points out that it is not singularities but interconnectivities and flows between particular cultures that lead to the cinema’s capacity for deeply phenomenological and pedagogical gestures. Somewhere Between gives us the interval or the interface between places where identities and experiences take up their meanings in Hoffman’s memories of a shared world. Yet it is also the characteristic of the “found story” that it remains open, fragmented, that it burn through myths and clichés. It must resist the “self-contained whole” that would betray its force by casting a tight structure with a beginning, middle and end around its anonymous core. The found story Kracauer explains arises out of and dissolves into the material environment, often in “embryonic” forms that reveal patterns of collectivity (Theory 246). The found story comes from the aesthetic of the street and we should add, holds infinite possibilities for the psychic investment in the whole even as it takes it apart. In the end, Hoffman may well have broken with Kracauer’s prescriptive visual aesthetics by staging reality with word, image and black leader in a way that actively petitions the dreamer to envision what was and what might be. What holds the spectator’s interest in Hoffman’s film is the gap, the place of imagining: the black smoke from the truck, the children weeping, the sky and the boy’s spirit as it “left through its blue”. Take for example the films of Jonas Mekas, Andy Warhol, Jean Rouch, Agnes Varda or Chris Marker who use the camera as an intrinsic aspect of performance. We could also include some of the more self-reflexive documentaries by the Unit B directors at the NFB of Canada. Cf. Catherine Russell Experimental Ethnography: The Work of Film in the Age of Video (1999). Travelogues are films made by tourists. They are defined by their creators’ decision to remain on unfamiliar terms with unfamiliar surroundings. These are not documentaries, which presume or strive for some unmediated relation to their subjects. Unless they can demonstrate that they are provisional and selective, documentaries are prone to be mistaken for the truth. Unless they can demonstrate that they are art, travelogues are largely the product of hobbyists who can afford vacations. Travelogues may affirm their artfulness by appealing to an aesthetic derived from the lyrical avant-garde, or, more frequently, by adopting the discursive strategies of fiction films. Somewhere Between Jalostotitlan and Encarnacion takes the latter route, all the way to a Mexican crossroads of the Real and the Imaginary. The fictive convention relied upon by Somewhere Between establishes an artificial contiguity between the film’s two discrete components: intertitles alternating with images (of Mexico, mostly). This convention is associative editing, a neat version of the so-called Kuleshov effect, whereby details noted in the intertitles are presumed to refer to the images they immediately follow or anticipate by the simple virtue of proximity. The dead youth is nowhere seen or implied in any of the footage. The titles state that Hoffman “put the camera down.” But the cop car that sped by his corpse must be the very one just seen passing the Coke billboard. Likewise the beggar girl who was conceded a peso is identified as the beggar girl who then appears. And the girl with the big eyes awaiting her dead brother? There she is, her imputed lingering iterated by symbolic association with a concrete snail. Much of the film’s remaining footage is neutral and irrelevant to the text, but marshaled to support a funereal aura through melancholy slow motion or sepulchral, greenish-black tints. That the film’s apparent coherence of text and image is a construction of cinematic artifice should be obvious, but the film condescends to underline the point. The soundtrack, a plaintive sax solo, twice jars incongruously with footage of musicians playing visibly different tunes, prompting suspicion of any facile congruence between events and their remains in the picture world. And in a sequence quite exceeding the credulity that associative editing might sustain, a funeral procession plods down conspicuously non-Mexican (i.e. Toronto’s) streets, a near-parodic intrusion that must be rationalized as a metaphorical digression on the universality of death, or some such thing. All these contrivances and retractions cumulate in a film whose reliability as documentation is severely undermined by its imperative to simulate fiction. Somewhere Between thus exploits a special tension inherent to the travelogue as a genre. Conventions that would affirm the continuity of narrative films, or the veracity of documentaries, are here destabilized, indeterminate, somewhere between… where, exactly? Clearly not the poles of a debate concerning the film’s ethics, which it suffered when it was first exhibited in 1984. Its supporters regarded the omission of the child’s death as a noble refusal of spectacular and exploitative documentary practices. Its detractors, conventional ‘journalistic’ documentarians, considered the film irredeemably deprived of the potential impact conferred by such a powerful image. Both these arguments assume the film’s images support the text, signifying only the conclusive absence it describes. But the latter position does implicitly contain a more incisive interpretation: footage of the accident or its aftermath would confirm that it actually happened. This shopworn raison d’etre of the journalistic documentary finds application here; an appeal to evidence validates the skepticism this film seems designed to provoke. Its issues aren’t ethical but ontological. Did the dead youth exist, or did Hoffman invent him? Given the film’s lack of positive evidence, coupled with its protracted insistence that it be acknowledged as a synthetic construction, the question remains. There are two plausible answers. In the first instance, Hoffman sifts through a large amount of Mexican vacation footage to find a few shots that, by chance, contain imagery similar to details he recalled of the accident and to the text he wrote to describe it. Or he returned from Mexico with a relatively small amount of attractive but disparate, mismatched footage which he united into coherent form by fabricating the accident as a kind of plot device. Occam’s razor might suggest the second option, but that’s not the rub. As film critic Rita Gonzàlez writes “…international filmmakers have been drawn to the notion of Mexico as a transgressive or mythic space, an eidolon that they have done their part to perpetuate.”  As the avant-garde film canon attests, south-of-the border has been a popular destination for filmmaking tourists, the special condition of their alienation in Mexico circumscribed by this imperative to solicit visionary experience. The roster of sojourners include Bruce Baillie, Bruce Conner, Richard Myers and Chick Strand, who made most of her career around Guadalajara and once confidently decared “Mexico is surrealism.” The Mexican travelogue is almost always their projected phantasmata. The ‘reality’ of the death in Somewhere Between is akin to the ‘reality’ of, say, the quintessentially Mexican peyote hallucinations in Larry Jordan’s Triptych In Four Parts: that is, as real as permitted by illusory circumstances. The virtue of Somewhere Between is to be conscious of its complicity in this tradition of cultural mystification. It inspires and permits doubt. It doubts the authenticity of the particular experience it describes, the authenticity of Mexico as an experience of the ‘mythic,’ perhaps ultimately even the authenticity of experience in general. Typical of the traveler’s tale is a tendency to embellish. Rarely is it so evocative, or so obliging, of the tendency to disbelieve its teller. In ‘The MexperimentalCinema,” catalogue essay published by the Guggenheim Museum, 1999. I met Phil Hoffman at the 1984 Grierson Seminar. His films were a breath of fresh air amidst so much conventional material. His films blithely side-stepped the orthodoxies so taken for granted by those who believe documentary cinema is an educational rostrum, is about questions of balance, is essentially a dissertation on something described as ‘truth.’ Meeting him in the context of his films backed up my impressions of his aims and abilities. His work is an encouragement to those who want to use autobiography as subject matter, personal vision as a trademark, and show how small resources can be a positive virtue. It was Phil’s suggestion in London several months later that he would like to be some sort of witness to the feature production of the film Zed and Two Noughts in Rotterdam in the Spring of this year—which I am certainly agreeable to—though I will not hide the fact that I believe, as a filmmaker with a personal vision, he is well past the apprenticeship stage. What he needs now is opportunities, encouragement and experience. Since his method is to work with a camera as a constant companion, I would wish he could be encouraged to make a modest film whilst he is in Rotterdam and London, certainly to be encouraged to shoot some two or three thousand feet of 16mm. The desirability of his presenting a script before hand, as far as I can see, is not necessary, considering his work method. In fact, I think it ought to be a condition of his association with the Zed and Two Noughts project that he shoot on his own on any subject whatsoever. Most of the relevant detail of the production of Zed and Two Noughts Phil has already mentioned. It is perhaps not so strange a co-production, as seen from a British point of view, but nonetheless will present a nicely complex mixture of finance, production, cast and crew that aptly mirrors the complexity of the film’s structure and content—the ambivalent diversity of species and purpose—of beasts and men—both sides of the cages in a zoo. Phil has volunteered not just to stand by and observe but to offer practical help which will always be useful on such a modestly budgeted, ambitious film. If he (and you) believe that he (and you) can profit by his experience with the production, then I am certainly happy to invite him. If there is anything else you would like to know, I am sure I can help, though I would be obliged, as I am sure you would understand, to keep bureaucracy to a minimum. The production of a feature film is very time-consuming and demanding. Here’s hoping that you can agree to Phil’s participation. The film is a series of “telling” incidents in which events, which fall short of expectations, are confronted by more “vibrant” memories of the past. The subject, the filmmaker/diarist, whose consciousness encompasses this flow or passage of time, uses failure to make his strongest points about the convergence and intermingling of anticipation and event, experience and memory. On the road, he and his friends spend time with an old buddy who makes his own music at home but has to play in a military band to earn a living, forcing them to come to terms with their own diminished expectations on the trip they are undertaking as compared to trips in the past. The story of a wood carver who lives with his family in rural Nova Scotia seems idyllic until we find that he must also work in a fish cannery to survive. The film itself is an account of failure. Spurred on by the mythology of Jack Kerouac and his life on the road, the travellers visit Robert Frank in order to learn first-hand about the Beats. Frank matter of factly dismisses their quest by noting that Kerouac is dead and the Beat era is over. In a partial response to this shattering of the myth, the film­maker goes back over the ground of the journey once again, only this time he includes the frustrations, the dead-ends and the low spots. The smooth, linearly developing narrative that we earlier understood to be the product of the filmmakers consciousness is now questioned and replaced by a series of stops and starts, memories and reveries. The final sequence of the film marks a re–evaluation and change most emphatically. The sequence shows a beach in Newfoundland on a bright clear day; children and dogs crossing in front of the camera. Yet each time some­one disappears off-frame the filmmaker jump-cuts to a new action. On the beach where the road ends discontinuity becomes a virtue, a form of concentration that validates exceptional experience, just as recollection and anticipation validate certain memories and fantasies. These were the first words Robert Frank said to Phillip Hoffman when he was visiting the photographer in Newfoundland six years ago. “We were driving with a ’67 Dodge… And I only knew where he was staying from his photographs but I wasn’t sure of its exact location. We drove around and asked the way there, and they didn’t know. Finally we picked up a hitchhiker, who appears in Frank’s film Pull My Daisy, and he told me how to get there. We stopped at the bottom of the hill and I started to walk across it. And walking up the hill I noticed there was a man sitting and looking out to the sea. I was too far to say hello and at this point I wasn’t sure of myself. What am I doing here? What was the point of all this? Philip Hoffman is an experimental filmmaker for whom the making of a film, the process itself, is as important as the finished film. It is his way of keeping a diary. ” My films are a combination of everyone I meet, what I learn, e.g. from other filmmakers. It all channels through me. I’m in a way just a medium, but I might change it on the way, making it work.” He collects personal day-to-day experiences in the form of films, videotapes, audio recordings and written diaries. “When I film I write about what I film, and when I get the footage back, I write about that.” Then he examines and reworks his notes, diaries, audio, videotapes and films, analyzing and editing them to create a more meaningful understanding of past experiences and events. Gradually his films develop and certain patterns emerge. Only while editing does the final structure of the film unfold, without a script written before shooting. His film The Road Ended at the Beach (1983) is an example of this kind of theory in practice. It developed during seven years, begun when Hoffman was a student at Sheridan College and was shot during his travels in North America. Finalizing the film was also one reason to meet Robert Frank. Mabou was a good place to stop. The Road Ended at the Beach starts with waiting for the trip. Hoffman’s old friends and traveling companions Jim and Richard are preparing for driving and painting their van. The purpose of this last trip is to reunite old friendships and experiences again the feeling of the earlier journeys. They meet an old Asian man, who has traveled the world for ten years. They meet an old cyclist, who has traveled around the world since 1953 and who is now going around for the seventh time. They drive and meet old friends, and try to experience again Jack Kerouac’s and Neil Cassidy’s sizzling Mexican nights. The film turns into a discussion of the filmmaker’s own mind and personal growth and also the realization of myths and the need to break them. And life can be experienced better outside home or the place which is called home. Most of Hoffman’s eight films are results of traveling. His newest one, passing through/torn formations (1987) started when he visited his relatives in Europe during the summer of 1984. Hoffman’s father is German while his Polish mother was born in Czechoslovakia. He was born in Kitchener, Ontario and lives now in Toronto. The film describes his mother’s background, but is at the same time an investigation of how history can be recreated and formed differently with different kinds of media. Hoffman tried also to reunite the family by his work, their lives divided on different sides of the Atlantic. His films are subjective recordings of his own life, while weighing in against myths and conventions. ?Oh,Zoo! (1986) is a puzzle-like study of reality and truth, how they can be created in cinema and treated by cinematic means. The framework for the film is the documentation of the making of Peter Greenaway’s A Zed and Two Noughts. This connected again to Hoffman’s own observations on life and his experiments, which contribute to the underlying questioning of documentary evidence. What is documentation, what is narrative storytelling and what is the difference between them? It is up to the audience to decide. Robert Frank appears in The Road Ended at the Beach just in a couple of scenes, doing his own thing, nailing and looking over the sea. As an everyday person. Jim McMurray: How did you happen to find a spot like this? Robert Frank: Oh, it’s just an accident. JM: You were just up here? RF: Well it was on a bulletin board in Port Hood. Yeah, it’s pretty nice. Richard Kerr: What are the winters like? Pretty severe. RF: The wind is sometimes pretty rough but it’s not too bad. I like it in the winter. JM: Where’s the coal mines from here? RF: Past this house here. See that house? There’s a hole going down, that’s where it used to be. It fell down the tower. RK: Are they going to use it again do you think? RF: No, it’s all under the water so it’s too expensive. JM: Too dangerous too, eh? RF: …it’s too expensive to come in here and you know look after the track here. It takes a long way to get it out from here. JM: Can anybody come around here dig themselves and use it in their fireplaces? RF: People use to do it, use horses, get some chunks. Not anymore. JM: I sometimes work with, you know like iron. Bending it in a furnace. I went down to the railway tracks and they were selling coal at places where an old railway car had tipped over. All free now. RF: Where do you come from? JM: Ann Arbour. I saw a picture in your book. I think The Americans, of someone laying in a park. JM: Do you get away from here very much anymore or do you stick around home? RF: Well, when I have got to go, I got to go. When you got to go, you got to go. I like it here. RK: I just saw they had a display of your pictures at the Art Gallery of Ontario in Toronto in the spring. Were you up there at all? RF: No. No I didn’t go. RK: Just send the pictures and let them do the talking. RK: I guess what you know were looking for and I guess it’s in the form of some sort of advice, is that, I imagine there’s no secret to it, but what frame of mind were you in when you did The Americans. And how conscious was it? The spontaneity, this sort of thing. RK: Because you read so much stuff and a lot of it frankly is you know? RF: I think spontaneity might be a way of not thinking you know. Maybe if I would define it. Spontaneity, I don’t think I thought a lot about it. It was more feeling than thinking. RK: You just did it. What sort of line as far as equipment goes, were you outfitted with. The finest equipment of the time or were your tools just what you had? RF: No, I had ordinary equipment. A couple of Leicas, one with a normal lens the other with a wide angle. RF: It helps with good equipment but I think it’s more important to have good equipment when you do carpentry. It’s more exact. When you’re out there working alone I think that. Then thinking about carpentry it’s not that you’re working together with someone. But doing The Americans at the time, I think that it was wonderful to travel alone. RK: That’s what we were talking about this morning. This is Phil’s project. I’m doing sound. Jim’s doing the driving and some other things. We were wondering, to do that he’s doing, to do it by himself, he’d be more mobile. He wouldn’t have to listen to our bitching and complaining you know. RF: Well if it finally gels, what you do with the tape and what he does with picture. It’s an ongoing process. RK: Have you ever tried much team work as far as film. RF: Well with films I think you have to. It’s too hard to make films alone. Philip Hoffman: How about Jack Kerouac and Pull My Daisy and films like that or that film. Did you shoot the film and then he did the narration? RF: Right. He looked at the film and narrated as he looked at it. PH: Was that a good way to work? RF: That could be called spontaneity. I mean that certainly was a spontaneous piece of literature. PH: Was there editing involved? I mean did you go to a third person again? After you had shot it and he had done the narration, anyone cut things out? Like, On The Road apparently has been butchered quite a bit and I was just wondering how much manipulation happens in something like this. RF: There was very little taken out. We just had to fit it sometimes, it ran a little bit over or we wanted to put some music in, so some words were cut out, some sentences. But it didn’t happen very often. Of the thirty minutes that he narrated maybe two or three minutes were cut out and that’s about it. RK: Earlier we were down talking to Allen Ginsberg, doing some research at Columbia, that he kept there, and I was wondering, is there… those people they seemed like such a close knit group at the time. Are they scattered now or do you have any contact with any of those people? Is it just a time and a place and now you’re in a different time and place. RF: Well Kerouac is dead… he’s away. Sometimes I see Allen. I never kept that close in contact with them. So, I don’t know. If, Corso’s living mostly in Italy. I think it pretty much goes apart after… years. RK: Yeah, that’s what I find with my friends. We just drift I’m out here now and they’re all out in Calgary in the real estate boom. At the time, were the conditions right to work? Where things as free as they like. You know we were only two and three years old then but we had the image that it was free, that everything went and there were no problems. Did it have that feeling to it or is that something the media played upon. Grabbed. RF: I don’t think that it gets freer. You know good people work. They work the same in 1980 as you would have worked in 1960. I don’t think you know its people. Maybe it was freer because you knew less and you were moreinnocent. Now I wouldn’t be that free simply because I know more about it. Much more. RK: Are you familiar with the term zeitgeist? RK: : Zeitgeist. It’s a German word for spirit of the times. RK: I heard that word when I was in Switzerland about six years ago. That was the word all the people were using. I didn’t know what the hell it meant. It could have been an amulet for all I know. Frank: Well I give you another. How about Weltschmertz? RK: Weltschmertz? We come from a German town so we get all this. A town in Ontario. It’s a rural German community, so you get osmosis over the years. It’s kind of interesting. RF: I think this dog makes a good soundtrack. RK: Yeah. I just did a film called Dogs Have Tales, about my other dog. I don’t go anywhere without a dog. RF: So who is in charge of editing the film? PH: I am. It’s a project where we all work together. I think one of the things that’s happening is in a way it’s just gone a week and things are kind of gelling… We all kind of got our separate jobs now, you know. RK: A guy gave him a free truck. He went to California and couldn’t take it with him. It was fifteen years old and did him a favour once and he said take care of this for me it’s yours. RF: What kind of truck is it? JM: It’s a Dodge. An old Dodge. JM: Well we put new doors on it, but it was painted covered with flowers and beautiful things like that. But nowadays I guess you can get away with things like that. Is there anything we can help you with, any heavy lifting? RF: No I can’t think. No, I don’t think there’s anything. RF: How long have you been here, five, six years sort of a thing? RF: No we’ve been here ten years. Eleven years. We came here in 1969. RF: We built this you know? Yeah, it’s satisfying to build something. RK: You bet it is. That’s something I was never brought up to do but it’s something I want to do. RF: It’s satisfying to look here, you know? See the water? RK: Eat like a king out here there’s food. There’s seafood. Want to hit the road? I think that’s right appreciate that. RF: Well I mean it thought it would be more like having to look into the camera. RK: No. We left the make-up girl at home. Make-up person. RF: I always liked it when films you know had ? when you could move it around. When I was teaching in sometimes Super 8, I always liked that about Super 8 because I completely divorced it from the sound, and there’s so many possibilities then. RF: You always stumble on something that makes sense that enhances the picture itself. PH: I think of a saying… let the feeling find its own form. It’s a good thing for me to remember for this film. That’s what I’m trying to do and sometimes it’s really hard… travelling is hard enough …rather than just taking pictures. It’stwo jobs in a way. RF: I use to think… how is the wind doing? RK: It’s kicking the hell out of this mic, but what can you do? RF: Sometimes the wind sounds so beautiful. What kind of a machine is that? RK: It’s a Sony. A Sony cassette deck. It’s got little toys on it you know …too many gadgets. RF: You always work with one mic? RK: This can work with two. RF: Yeah, but you do everything with one? RK: As much as possible. I’m not a technical person so I got to find a simple machine. Don’t need a Nagra. PH: We’re just using this thing with 3 or 4 different lenses. RF: Is that a combination lens? I mean that’s just one lens. PH: It’s just one, yes. That’s one thing I wouldn’t mind for this trip is maybe not changing lenses so much. RF: You just work with that one lens? RF: You have other ones but then you have to take it off. PH: Yeah, but not for this one. It’s the only one I could get a hold of, but it works out. RF: What do you shoot? Colour? PH: Yeah, negative. We’ve shot for three or four years now west and east. This is our second time out east. I shot super-8 and collected sound when I first started a while back, and now what I’m going to do with the super-8 is blow it up to 16mm and use it sort of as a concrete form of memory. And so over the years we have been returning to places and people to see how they’ve changed. So hopefully the film will have some history to it. RF: How long is it since you’ve done the super-8? PH: 1976… about four years ago. JM: We came out here last year and got some stuff, but the car kept breaking down. It was a newer one then this. Do you still go down to the School of Design in Halifax. RF: No I haven’t been there since at least three or four or five years. RK: I was thinking about going there back to school for the fourth time. Think it’s an alright place? RK: That particular one. If you care maybe I shouldn’t ask you that. RF: Well if you feel like you need to learn something and that’s the way you feel you can learn it. What would you take there. RK: Art education or something like that. How about teaching I do some teaching now, but you don’t get paid well when you know the stuff but don’t have the letters behind you. They don’t pay you as well. But I don’t know, change my mind every day, that’s what I got one for I guess. RF: Well if you can go to school that’s nice. It gives you place, not in the streets. JM: Especially out here as opposed to Toronto. I just got out, been going for years. Got a Masters Degree in Fine Arts and I finally realized that it’s not doing me much good at all. I wish I had worked all that time. The dog likes it here. He likes those cliffs, feels like he’s climbing mountains. RF: It’s your dog, eh? JM: It was his birthday two days ago, two years old. You getting pretty stuck to this place here? I mean hard to leave? RF: Well I’m attached we put a lot of money into it. We’ve worked on this for a very long time. JM: Nice to make something and have something there. RF: It seems permanent. It doesn’t change. It’s nice to watch nature. Watch the water, the wind, the sea. JM: That’s what I like. I didn’t really want to come on this trip. It was hard to break myself away. How are the people down here? Pretty nice? RF: Very friendly, yeah. Well they’re very discreet. There’s a lot of room, nobody bugs you. RF: Yeah, they’re mostly Scottish. RF: Some of them speak Gaelic. RF: It’s a good place to live. I don’t know about working. I have a hard time working here but June works a lot. She works on the building. Why don’t we stop for a while? JM: How do you heat in the winter? Is it wood? JM: You just go down in your car or truck and pick it up? RF: Yeah. When we just came here in 1969 coal was something like eleven, twelve dollars. RF: A ton. And now it’s forty and I guess that’s still cheap. June Leaf: It’s good huh? RF: Can they have some tea? JL: OK. You want some tea? RK: Get back to work. RF: It’s a good day for working today. RK: Yeah. Not too hot. JL: Are you guys having tea? JM: Phil you want some tea? A lot of people paint their shingles. But I guess that once you’ve painted it once you’ve got to paint it over and over again. JL: Most people paint them. They do, they like to paint them. It makes the house look fresh every couple of years. RF: With just oil on you know, seems to keep them pretty well. JM: That’s a pretty colour though, silver. JL: See these are old shingles, see we’re reusing them they’re very strong. I mean, they’re just like new shingles. Look at that. That was already cracked when we took it off. See we took it off with a shingle puller. That way where you see we’re putting it back it varies. S: Oh my… isn’t that beautiful. M: Philip of course… and Marcie looks like a little girl. P: What do I look like? M…you look like an Eskimo, yes. B: Are we going to do it tomorrow? M: ..and the old Princess. M: Oh, is that ever precious. That was in our back yard, in the old house. S:…aahhh, look at the lake. D: Colleen, that’s a good one of you. S (Colleen):I don’t think I look so bad and you know Phil, we used to go fishing all of the time. S: Look at my feet, how I always stood. My favorite shorts. P: I tell ya, that’s a good looking one there. S: I Wish I knew you better then. M: We went out walking, it was Thanksgiving. D: ..and you were feeling lousy. S: Look at my glasses. D: There you can see where the cottage was. D: We could skate it on the whole lake. D: You have the right stance there. S: Oh, I want to go back. S: I wish we had those scarves. M: Where are those scarves? Ba: I’ve got some like that. A: It’s off the goalpost! M: Is that our old Princess? M: Look how fat she was. M:I think about her often though.